Tackling multi-source inventory from top to bottom with an in-depth look at best practices. Managing inventory across multiple sources and channels is an expected challenge these days. While many organizations use the latest technology to facilitate and automate much of the process, that just isn’t the case across the enterprise. Thankfully, with some forethought, a good system, and a little trial and error, keeping track of your inventory across different channels and sources can be reduced to a much simpler process. We’ll cover 7 in-depth chapters from common definitions to choosing the right software in this complete guide to multi channel inventory management. 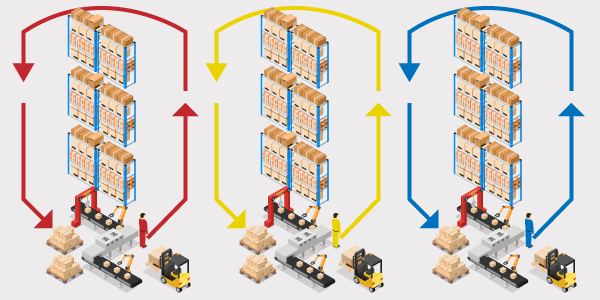 What is Multi Channel Inventory Management? Multi-channel inventory management (also known as multi-source inventory) is the process by which businesses account for and track orders from various sales sources on inventory that is stored at multiple locations, such as marketplaces, ecommerce, retail, and wholesale. An important component of this process is how the information is shared across the business - since many different departments need inventory data for different reasons. Having an unimpeachable source of inventory data that all stakeholders can access removes an otherwise troublesome layer of alignment. Most merchants would agree that inventory is the heart of their commerce operations, and being able to seamlessly manage it across multiple channels has become essential to maintaining a competitive edge internally that translates into a strong customer experience externally. Creating a consistent experience for customers as they interact with a company or brand across various mediums is the reason multi-channel inventory management has become a focus in the past decade. If inventory selling from multiple sources is managed correctly, customers never know the complexity required to make it happen. When the process is working correctly, you don’t really notice it. After all, who notices a lack of problems? Most of our attention is directed at challenges or issues to be resolved. 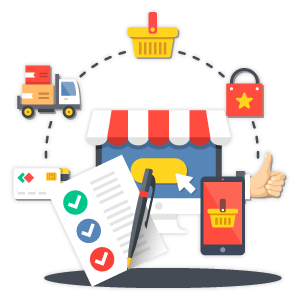 The end result for the customer is that they can order from anywhere, receive their order in the manner of their choosing, and are never surprised about an item being stock or not. The end result across an enterprise is that inventory data is always up to date, stock levels are never a surprise, and customer satisfaction is always high. In store fulfillment only works of inventory is managed very well and is always up to date. This is the holy grail of a phenomenal customer experience. With most national retailers already offering this option, it’s becoming a competitive advantage for regional businesses that have a smaller footprint. Consumers have extremely high expectations, driven by those large brands. They are able to purchase however they want - and that means many different channels. In order to seize the advantage of in store fulfillment and reduce ugly surprises simultaneously across channels and marketplaces, businesses need an unimpeachable source of inventory data. Let’s look at an example, powered by multi channel inventory management. Order placed on ecommerce website, picked up in-store. They see they can order it online, and get it shipped to their house, which will take 5 business days, or they can pay for it now, and pick it up in store tomorrow morning (the store is 15 minutes away). They choose to pick it up in store. The order is placed, paid for. The customer picks up their order the next day. Let’s look at what’s going on behind the scenes to make that happen. The ecommerce website’s inventory levels are updated while the customer is browsing. It doesn’t go out of stock, so they don’t see any change. After entering a zip code, the customer sees how shipping would take from the closest warehouse to get to their house. They also see the closest store that has the product they want in stock, and how many of them they have. Upon confirming their purchase, the total inventory and the store inventory are updated, and an employee at the store gets a notification to set the product aside. The employee verifies that the customer picked up their purchased product. The customer never notices a difference in the process, but behind the scenes, there’s a lot going on. The system takes incoming orders into account, and adjusts visible inventory to sales channels in real-time. Had the product not been available online, it would have simply shown as out of stock, but with an option to pick up in-store. The system can also see inventory levels in different locations. The customer could have chosen one of a few different stores, but since they plugged in their zip code, the system routed them to the most convenient location that had that product in stock. Lastly, the employee at the store was notified of the purchase, and knew to set aside the product. This is how seamless multi channel inventory management can create a customer experience that is second to none without putting undue strain on employees and managers. There’s just no way around the fact that to make all this happen in an economical way, there needs to be help from an advanced piece of software. Sure - you’ve definitely heard stories of people using a spreadsheet to manage their inventory, but once you expand into multiple channels or start selling anything close to a high volume, you need some help. Operations managers can see inventory KPIs and make appropriate changes to increase efficiency. Purchasing managers can see how much and how often to reorder from vendors. 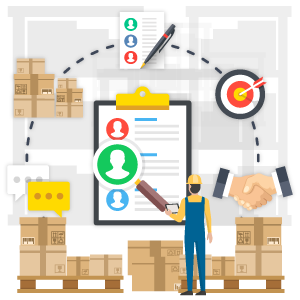 Warehouse managers can see where products are, how they are being treated, and assign tasks easily. Warehouse staff can do their jobs quickly and without checking multiple systems. Retail employees can help customers quickly with the most up to date information. Finance can see how much cash is in inventory, and how quickly it’s being turned over. You get the idea - the benefits are numerous, and they stretch across the enterprise. Since everything revolves around inventory, the faster you can churn through it, the better. In a perfect world, a new shipment would arrive from every vendor as soon as the current inventory was sold out. I’ve got bad news for you: We don’t live in a perfect world. That’s not going to happen. Especially not when selling through a lot of different channels. The more you add, the more complex the process becomes. What are the factors that make this complex? If you’re selling through 15 different marketplaces, 2 ecommerce websites, have 20 retail locations, and also attend consumer exhibitions, there’s a lot of ways that new orders can come in. Each of them is an opportunity to provide a great customer experience. Each of them is also subject to changing data and human error. Warehouses, retail stores, and 3PLs are the most common distribution options, but without a common system to tie them together, products may not get to customers as quickly as they could. For some, customers will have the option to choose theirs, but a lot of the times, there is only one option. 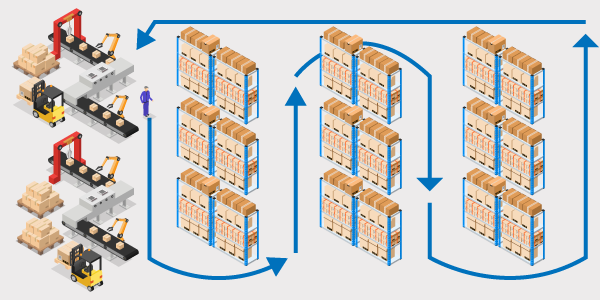 Adding more options for distribution increases the complexity of distributing orders. Your commerce stack is probably pretty deep - most are. At an absolute minimum, you have an ecommerce platform, an inventory management system (of some kind), and something to track finances or accounting. If your operations are more developed, you’ll have multiple marketplaces integrated, multichannel softwares, and possible specialized systems for order management or warehousing. Each of those systems has a chance to fail, and more importantly, the connections between each of those systems are tenuous. Since you likely don’t have direct control over the technology behind the integrations, it’s possible they can fail without you knowing about it. More systems = more problems. The goal of the inventory management process is to maintain the most efficient amount of inventory in stock while also maintaining an excellent experience for the customer. It’s similar in concept to the order management process. It’s built around the customer experience on one side, and stock levels on another. It’s a seesaw that involves delicate balance, concentration, and hard work to manage correctly. It needs to be a fully documented process. Maybe not with giant playbooks or folders, but at least in a graphical way that’s can be referenced easily throughout the day. This helps the entire team see the process and how they fit in, so they understand the big picture and can contribute more than labor. Your process might change significantly for multi channel. Customers likely won’t understand how inventory is managed behind-the-scenes, so they won’t be forgiving if a product is marked in stock in one location, but appears out of stock in another. The same goes for in store pickup - if an order isn’t ready to picked up when it was supposed to be ready to be picked up, the customer may cancel their order and ask for a refund. According to Shopify, the solution to this is multi channel inventory management software. Since this type of system can sync inventory levels across all different sources, it’s the beating heart of the inventory management process. Think about the example above - 15 marketplaces, 2 ecommerce websites, 20 retail locations. If these are connected via a single inventory management software, everybody wins. Employees across these locations can all see the same inventory, and customers can easily find and choose what they want. With a system like SkuNexus, adding new locations is extremely easy, and inventory is easy to find in the system and the real world, automatically providing customers the most accurate data. Inventory control is how businesses get the most out of their inventory. It’s a balance of incoming and outgoing stock, careful measurement, forecasting, and constant improvement. The goal of inventory control is to generate the maximum profit from the least amount of inventory investment without intruding upon customer satisfaction levels. On one end, sales is the driver of inventory practices and management. When an order is placed, it becomes the most important thing to get that order to the customer by the date promised. This happens hundreds or thousands of times per day. That’s one input of the inventory control equation. Another input is from vendors and suppliers. They send a certain amount of inventory, usually on a specified day of the week or within a certain time frame. 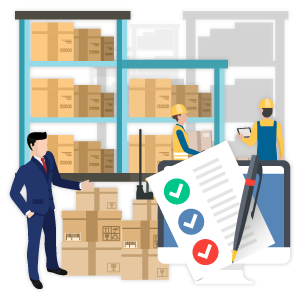 These inventory control techniques are the backbone of good inventory control, and make sure that inventory is moving through the warehouse at a speed which is good for customers and for the lifespan of the products. Following these techniques is a good place to start. However, as your business evolves and grows, you may need to readjust. It’s more important to find what works for you then to copy an industry best practice. First in first out is a fairly common practice, especially when storing goods that have a shelf life or are perishable. When new inventory comes in, it is added to the ‘back’ - meaning it is the last item to get picked during fulfillment. To see how SkuNexus can accommodate goods with expiration dates, check out our detailed use case here. When orders are filled, they are filled with goods that have been in the warehouse the longest. This reduces the chance of inventory spoilage while it is in the warehouse, and ensures that inventory is being properly rotated. This does require a fairly organized warehouse, capable of rotating every new good as it is received. Sometimes called Par Levels, maintaining a set amount of product in stock before reordering establishes a cut off point that is understood by everyone. This number typically stays the same over time, but may change for busy seasons or sales. This level also factors in the time vendors need to deliver goods, and the time it takes to receive them, with a little padding for emergencies. See the graph above for a visual of par levels. An ABC inventory analysis will identify your top performing products by revenue, and your top performing products by volume. Knowing this allows better organization of warehouse space, pricing changes based on market availability, and with extrapolation, ideas for new products. The majority of revenue will come from A products, but they aren’t sold as often. This makes each order that contains an A product very important. By following the 80/20 rule, and you’ll have a good idea where of the 20% of your products that are making up 80% of your revenue is coming from. For more on ABC inventory analyses, check out this article. Conducting regular inventory audits will create a baseline for productivity, stock levels, and inventory operations as a whole. 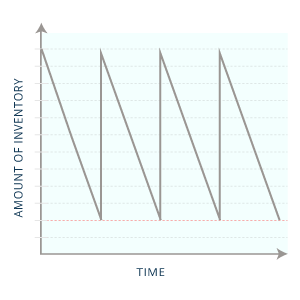 Inventory cycle counts simply tally up the inventory in the system versus the inventory in the warehouse, and should be conducted often. How often is really up to you - because it depends on the size of your business, number of employees, and breadth of products. If you have so many products that doing it in a single day or days would result in slower fulfillment or lost time, then break it up over a longer period of time or reserve a certain day of the week for counting. Ah, the crystal ball of inventory management - sales forecasting. Based on how your stock sold last year at this time, last month, last week, and more, you predict how you’ll sell in the corresponding future time frames. ...or you can trust an inventory management system to do it for you. 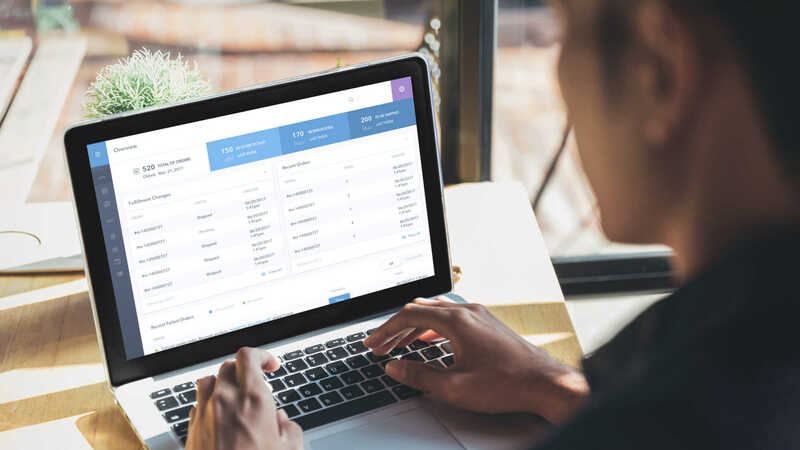 With SkuNexus, you can customize the way that your system forecasts, based on factors that only you know and are specific to your business, but don’t follow industry standards. Check out this post for a deep dive into techniques to manage your inventory. For merchants, measuring the effectiveness of inventory management is extremely important, since it’s the heart and soul of operations, revenue, and customer satisfaction. This metric defines how quickly you sell through your inventory. You want a high inventory turnover rate - that means that you are generating strong sales and moving through all of your inventory relatively quickly. With a large portion of assets in the form of inventory (instead of cash) moving through inventory quickly provides strong cash flows that can be used to reinvest or build the business in other ways. This formula removes any markups which may be present on inventory - which may provide inaccurate results and make your rate appear larger than it really is. After calculating this important metric, compare it to your industry average. This is a good way to tell how you compare to peers with similar businesses. Also, track this on a regular basis, and compare to your own historical data - it’s the most effective way to measure any projects or improvements you make on your turnover rate. This metric covers how much it costs you to store your inventory annually, as a percentage of your total inventory value. 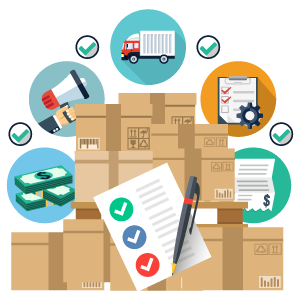 In order to determine inventory storage costs, add up the cost of items, handling costs, physical storage costs, and any other costs associated with the actual products. If they were purchased with a loan, interest or financing fees will contribute to this. This metric provides a good understanding of the efficiency of your inventory management operations. 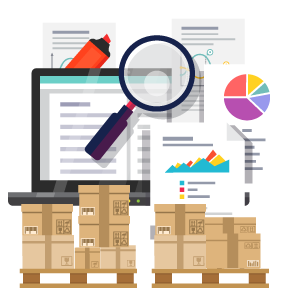 While it won’t provide in-depth information on specific products that may be languishing in the warehouse, it will prompt you to investigate that for yourself. The accuracy of your recorded inventory versus your actual inventory is a key metric that provides insight into potential theft, unreported damage, and adherence to process. Having an inaccurate count of products can be disastrous, leading to higher costs, poor order accuracy rates, and decreased customer satisfaction. The industry standard for inventory accuracy is very high - and the differences between top performers and the median isn’t very large. Above 95% accuracy is where many businesses fall, with the top quartile being 99.5% and above. Identifying where the discrepancy between real and tracked inventory is the purpose of this metric, and will help pinpoint your investigation. This receiving KPI tracks the total time it takes inventory to be put away after it is received from a supplier. A faster put away time means that inventory can move through your warehouse at a faster clip, lead times are shortened, and inventory carrying costs decrease. Put away time is traditionally a process that always has room for improvement. It may depend on the type of goods being received, or the location of those goods in the warehouse, or a haphazard, unorganized process, but there’s definitely something you can do to improve put away time. The warehouse is where inventory lives. It finds a comfortable spot during receiving, stays put until a customer purchases it, and then finds its way to the customer through the fulfillment process. Yes, that’s an oversimplification. But managing each of these steps requires careful coordination - particularly in large warehouses with many employees. 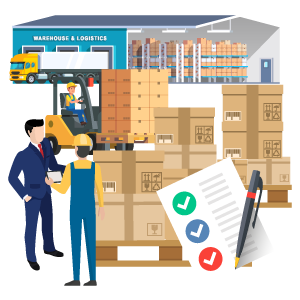 As your business grows and you add larger warehouses or more team members, the complexity required to manage warehouse operations smoothly will increase. The consequences of not having a smooth process can grow proportionally as well - you don’t want too many cooks in the kitchen. While focusing on reducing injuries and accidents may seem like a good approach, a more effective (and proactive) method would be building in training up front for new employees and recurring training for all employees. This creates a culture of safety, and ensures that equipment isn’t damaged, employees are healthy, and products get to customers quickly and without issue. Safe employees are happier, and by prioritizing safety, managers show through their actions that their wellbeing is a top priority. And yes, there are financial benefits to safety as well. Workers compensation is a largely preventable expensive, and scheduling other workers to cover lost time or paying overtime to a stretched staff can have negative effects on morale and profits. Be proactive and prioritize safety. It’s worth it. When I was young, my parents would always tell me to take good care of my things. Toys, technology, shoes - all of it. I was never very good at understanding the value of objects until I started to pay for them myself. In a warehouse, where equipment can cost thousands or tens of thousands of dollars, a certain amount of caution has to be in place to protect that investment over the years it will be in use. The same goes for shelving, tables, stands, and the other menagerie of equipment present in a fully functional warehouse. Accidents are unavoidable, but with good training and proper care, equipment can last a lifetime. A variety of training, maintenance, and caution are all necessary. Without proper care, equipment can break down or deteriorate faster, causing premature costs of thousands or tens of thousands of dollars, depending on the equipment. It can also lead to damaged products, causing irreparable damage to a large amount of product in transit or in storage. Lastly, the time savings are important - installing or purchasing new equipment can slow down day to day operations, and move focus away from getting *** done. Creating a sense of flow in a warehouse can have an uplifting effect on efficiency. You’ve no doubt heard the comparison of shopping in a grocery store - dashing up and down the aisles, forgetting something and having to backtrack, and not knowing where you’re headed. If a warehouse is organized like that, there’s no chance it’ll be a quick process for picking. A good flow also reduces the chance of accidents or blockages in high traffic areas. Civil engineers plan roads and intersections so that vehicles can move efficiently and safely - you’ve got your work cut out for you, since a warehouse is much smaller than a city or town. Regardless, the benefits are the same: increased safety and speed with lower congestion. Travel time can easily account for 50% or more of order picking hours. That’s why your goal should be to reduce the time spent picking, by reducing the amount of distance needed to be traveled. Lay out your warehouse so that pickers take a single path through it - the same path every time - that covers all items that may be needed. A single path allows faster transit time, shorter distance, and lower chance of accidents, since all employees are moving sequentially. Another option is assigning batch or zone picking. For example, a certain group of employees may be assigned to pick certain items, or a certain area in the warehouse. With separate groups of employees doing this, they won’t interfere with each other when picking. Clearly setting up packing stations with equipment and supplies within easy reach is a no brainer. Automating shipping carrier and service level decisions and pre-printing shipping labels is next level efficiency. But there’s a lot to improving packing efficiency. Keeping a clean and organized packing area, with easy access to equipment and supplies is essential. With additional clutter comes confusion and slower packing times. An organized warehouse is the natural byproduct of following the above recommendations of safety, care, and flow. In a perfect world, aisles are clean and have plenty of space to move around for the most popular products. Completing an ABC analysis locates the C products in the most convenient spot - easily trafficked, lots of space for multiple routes and easy put away, and if an accident does happen, the consequences are lower because they are surrounded by other C products. This separates the A products to low traffic areas of the warehouse, rightly giving these high value items preferential treatment and fewer touch points. Regardless of which category products fall into, aisles, shelves, bins, and any other sections are clearly labeled. Having items at about shoulder height, with SKU and product names readily available can speed up the picking process tremendously. Everything should have a place - wheeled equipment, packing stations, and receiving areas are in the optimal placement for the lowest amount of transit time and steps to complete given tasks. Possibly the most important step to managing warehouse operations is continuous improvement. After all, the output of measuring key performance indicators is an improvement to the process. And when a change is made, KPIs are checked again and then more improvements are made. There’s a Peter Drucker quote in here for good reason. Without measuring, you can’t manage. The first step to iterating is to measure inventory KPIs important to the business. Good feedback comes from every angle of the business: front-line workers that see their area, managers that see a full department or function, and executives that see the whole business. If feedback and changes are pushed from the top down with no input from other stakeholders, the changes aren’t likely to stick. This is particularly true when coming up with great ideas for changes. Front line employees might see things and be exposed to situations that management doesn’t fully understand, simply because they don’t do it on a day to day basis. Soliciting feedback from all sides is the best way to make an effective change. Once a change is made, be sure to train all relevant employees on how to approach it, and set a date to measure its effectiveness. The first day a new process is in place isn’t the best time to measure it, so it’s probably more effective to do this monthly or quarterly. The purpose of doing all this and improving warehouse operations is to create a better experience for the customer. Don’t forget that! Picking inventory management software that meets your needs is a tall order. The market is full of tools that will get the job done - from free options to thousands of dollars a month. Don’t just go Googling ‘inventory management software’ - you’ve first got to understand the right approach, or you’ll look at hundreds of options and have to find a needle in a haystack. Why do you need a new inventory management software? What is the main reason that a new platform is needed? The answers to these questions should drive your purchasing decision, regardless of features or pricing. This is the first gate that different systems have to hop through in order to be an option for you, so make sure you’re crystal clear on the main challenges the system is expected to solve. This includes features, integrations, core functionality, and of course multi channel inventory. If you’ve read this much, there’s no doubt that that’s near the top of the list, especially if you’ve experiences some of the challenges listed above. Forecasting sales is a key feature that any inventory management software should have. This allows you to use historical data to predict future sales, and is extremely helpful when knowing when to reorder from vendors or for busy seasons or sales. Location functionality drives inventory from multiple sources. 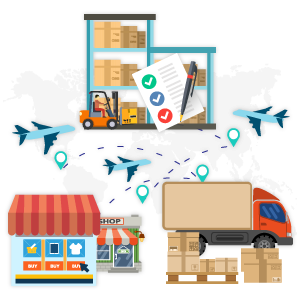 Being able to tag inventory by geographical and relative location are extremely important to tracking inventory wherever it may be. Real-time updates are essential as well. Without this, stock can be reserved for a customer, but mistakenly be sent to another. That’s definitely not a good thing, but real-time updates can make sure that that happens as infrequently as possible. Barcode scanning is needed if you currently employ scanners to track inventory. Many warehouses use these - but not all. If you do, you’ll need to be able to connect to them. Overlap with orders or fulfillment is not an absolute requirement, but is very, very nice to have. Using one less system for key functions that are tied so closely to inventory reduces time to update and makes everything run a bit smoother, since one system has inherently fewer fail points than two or three systems. Almost every system in your technology operations stack is going to need to integrate with something else. The most obvious one is your ecommerce platform - but it also includes systems to manage omnichannel sales, marketplaces, orders, fulfillment, and financial or accounting. There’s a lot to integrate with, so make sure you’re finding a system that integrates with or can replace your core stack. While the most obvious answer for the cost of inventory management software is ‘it depends’, that isn’t enough information to go on for most people. An inventory management system will cost between $100 and $3,000 a month, for the most part. The large variance is due to the functionality of different systems - some will keep track of basic inventory, while some will include other full feature sets, such as order management or fulfillment. In addition, there may be different plans or price hikes for users, integrations, or number of SKUs. Most importantly, do your research, and find out what works for you. Align that with the maximum amount you’re willing to pay, and you’ll have a good baseline to start your search. And if you’ve made it this far, schedule a short demo of the SkuNexus platform to put ALL of this into action for your business. Let's dig into how you're managing orders.